What’s everyone? All right, so here we are. Thursday morning finishing the day red, two back to back red days. But, today things were a little bit more moderate. I didn’t have any big, big swings. I had a couple of nice trades, like four or five green trades. Then, about three losses. So, I went from being up about $2,600.00 on the day, to being down about $730.00. So, not too much to stress about. Obviously, I was really hoping to be green today. Finishing up $2,500.00 would have been great. But today, we were just seeing a lot of choppiness. A lot of stocks pop up and then drop down. H-E-A-R, Hear, gaping up 60 percent. I think that’s the one everyone was watching, but priced at $13.00, that’s a little outside my price range. 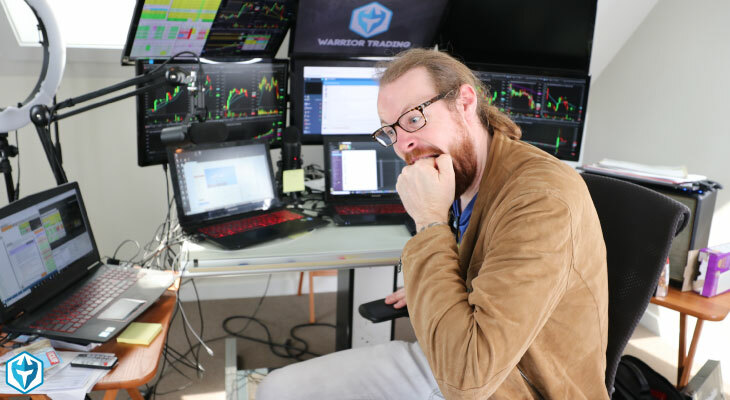 I made $650.00 on it, but I just … it’s not one that I can really get big positions on and get five, ten, fifteen thousand dollar winners on, it’s just not. So, Hear for me, I think it took a lot of the focus from other traders, got them all really tunnel vision on that stock. Then, unfortunately, it’s not one that I’m good at trading, so I didn’t really do well on it. I do well when the stock that’s in focus, the hot stock today, is one between three dollars and five. Or eight dollars, that’s usually when I can be aggressive and do well. I really understand how those trade. But as they get to the higher price ranges, I don’t do as well. So, anyways, made a little money on that. Made some money on a couple others. Then, had a good sized loss because what we kept seeing were these false break outs. Jumping in stocks and instead of opening up, they would drop. So what causes that? Well, when stocks open up … Someone asked me yesterday in one of the comments. I love when you guys throw comments down below these videos. If you like these videos, subscribe to the channel, like the videos, throw down the comments. I’ll come back through and answer every one of them. 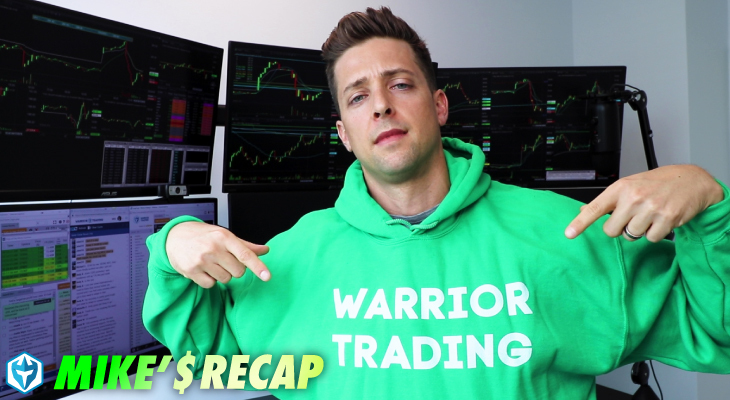 So one of the members of the Warrior Trading Community, or maybe just a follower on our channel, asked this question of … “Ross, what happened to waiting for the first pullback?” To the question, because a lot of these stocks I’ve lost on, you look and it’s like I bought in the middle of a big green candle, then it gets stomped out. So why didn’t I just wait for a pullback? The problem is, when you’re in a really strong market and traders are getting into really high levels of emotion, you have a lot of FOMO. What that means is that when you see a stock, it’s the fear of missing out. So, when you see a stock start to squeeze up, traders for fear of missing out, don’t wait for pullbacks and they just jump in. I can’t remember what it was, but there was one two days ago and I jumped in at $1.80. Next thing you know, it’s at $3.00. By just jumping in, I was able to make some really good profit on that. If I had waited for the first pullback, the first pullback never came. That’s what happens during these kind of feeding frenzies in the market. Stocks go from two dollars to six dollars without pulling back because traders are so exuberant, they’re so excited, FOMO is running so strong. But then you have markets, what we’re seeing the last couple of days where traders are being more conscious. So for a trader like myself that’s trying to capitalize on FOMO, if it’s not there, if it’s not in the market, well there’s not gonna be follow through. That’s the thing that there’s no real gage to indicate FOMO. How strong are emotions running today? We don’t have a technical indicator for it. It just kind of is the look test, the taste test. It’s just … Nah, I’m not quite sure, maybe it’s a little higher today, it’s a little lower today. Today it was a little lower, yesterday it was little lower. We’ll see what it will be for Friday. Then, you see that one, and then the next, and then the next, and then the next. Eventually, then, it starts to slow down, self correct. We go into a slow period, then it’s the next stock that starts to take off. So, you know, that’s the ebb and the flow of the market. Right now, we’re in a little bit of a pullback phase, second red day in a row. But, nothing to sweat about. Still up $57,000.00 on the month, so great month of trading. 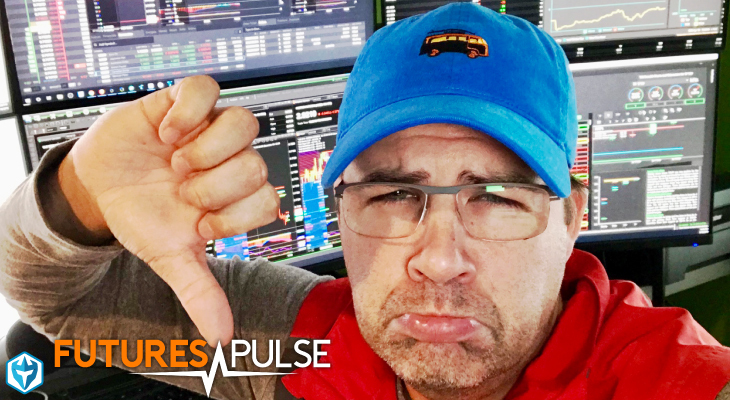 Anyways, we’ll break it all down in today’s Midday Market Recap. All right, everyone. 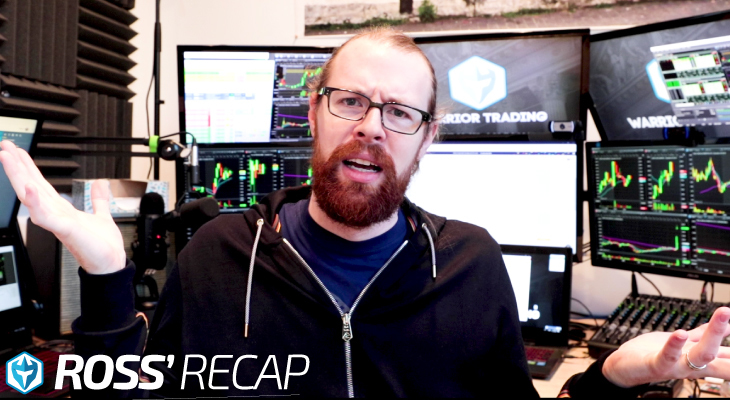 We’re gonna do our Midday Market Recap today over the trades from this morning. Overall, today, another pretty choppy day. We just didn’t see really good follow through on pretty much anything today. So there was lots of stocks that popped up, then came back down. I was able to make some money on some of those pops. Then, I gave back some money on some of the others. So total, I’m finishing the day down 730 bucks. Which is a little bit of a bummer, because I was up 2500 before my last three trades. But, 2500 is a great day and I would have like to have kept that in my pocket. But I guess I pushed it a little too much and gave back some of those gains. So, finishing the morning here down $700.00. You can see, we’ll look at some of the stocks I traded this morning. H-E-A-R, this was a trade right out of the gates. Anticipating a break of pre-market highs, so as soon as the bell rang, I was watching this to get in at $11.50. You can see in that first one minute candle, it popped up from $11.50 all the way up to $12.11 and I had put out an order for 7500 shares, it would be a $3,500.00 winner. I filled 2,000 shares and sold it for $665.00 at 80 and 93. Sold a little bit 12.04 and the rest at 11.49. So a small little scalp there. Next trade was VTVT, also straight off the gap scanner, watching this for a break of pre-market highs, 2.48. I jumped in at 2.50 with 5,000 shares. Sold it at 2.55 and 2.60, the rest at 2.54 for approximately … that first trade was actually $250.00. I took a second trade on VTVT anticipating a break of the VWAP right in here. I stopped out of that with a five percent loss, so only $133.00 of profit on VTVT. So those two were right off the watch list here and VTVT. Then, we were starting to watch … Oh, AWX, this was the other one that was right off the watch list. This one, we were watching for a break of the pre-market highs. I jumped in it at $2.75. It squeezed all the way up to $3.64, which is a crazy move. I had 10,000 shares of AWX at $3.75 but it did not hold. It came all the way back down and I ended up stopping out with only $1,300.00 of profit. I went from being up $9,500.00 but only for a second. There really wasn’t any opportunity to take that profit. It squeezed up, which held to that circuit breaker. I thought it was gonna go higher. I thought this is the one that’s gonna be the big mover today and it just rolled over. It came all the way back down in the next candle, so that was a little disappointing. It didn’t give me the win I was hoping for. So, at that point, we had seen choppiness on VTVT, HEAR, and AWX. Next trade, PTIE. This one hits our high day momentum scanner. So we’ve got our scanners running right here in the background, PTIE hits it. I jump in this at … what was it? Let’s see, we hit a high of $9.87. I got in PTIE at $8.90 and $9.02 and tried to add at $9.49. It didn’t get filled. Then, I tried to switch to selling … Actually, I added at $9.75, $9.78. I was really going for, I guess, a bigger move on this one. Then, I stopped out as it came back down. It came all the way back down to $8.73. So, with this one, I had like 7,500 shares. Instead of it being a nice big winner, it ended up being basically a break even trade, 140 bucks. It covers commissions. All right, so that was a little bit disappointing. Next trade was KOSS, K-O-S-S. This one, another one of those ones that popped up, hit a high of $2.71, then came right back down. Stopped out of that one. I lost $347.00 on it. Then, the last trade, FAMI, this was the one that was the worst. This popped up and when I first saw it I was like, “Oh, it’s a recent IPO setup, a breakout.” So I liked the look of it a lot. I jumped in this one at a high of $8.83. High of day was $8.83. I bought it at high of day and it came all the way back down to $7.65. It was just pathetic. It didn’t hold up at all. So, I took a $2,600.00 loss on that one. That’s the one that really kind of ended the day for me because it put me from being green on the day to red on the day. So that’s a little disappointing, but that’s kind of what we saw today. Lots of stocks that did this. Pop up and then drop back down. We saw it on FAMI. We saw it on KOSS, we saw it on VTVT. We saw it on every stock that I traded and we saw it on a bunch of stocks that I didn’t trade. So, today is one of those days where I’m not making any progress but I’m also not falling, really too deep in the hole. Seven hundred dollars is … that’s one trade. That’s half a trade. It’s not a big deal. So all things considered, today is just another day of sideways price action waiting for things to open back up. So, yesterday was a bad day, but today is not that bad. So down $731.00 and it’s the 83rd day of the year. Second red day in the month of May. I hope I can finish the week tomorrow, Friday, with a green day. Just kind of reset over the weekend and then come back next week with some good momentum. Good focus trading. But I think the issue here is that last week, Wednesday and Thursday, I made $60,000.00 in those two days. Friday, I made another $8,500.00, so $68,000.00 in three days. That’s when we were seeing that feeding frenzy, right? That’s when we talk about when the market just get really strong and traders get really excited, we see that feeding frenzy. Traders just jumping on the next stock that starts to squeeze up. Stocks left and right squeeze up, halted on circuit breakers, going higher, and it’s just a great day. It’s a great opportunity to make a lot of money. That’s the greed in the market. We’re able to capitalize on that FOMO that other traders are experiencing. They feel FOMO, the fear of missing out, and so that gives us those opportunities. But, then you get to a point where more and more of those stocks that pop up, don’t hold their levels. They come back down. The market was irrationally strong, and now kind of common sense is coming back, and things aren’t holding up. So that’s when you’re gonna start to see more false breakouts. That’s when you’re gonna see long biased traders starting to get more scared and short sellers starting to get a little bit more greedy on their side. That’s when we see that shift. So right now, in the last two / three days, we’ve started to see that shift. What we really need to create the next round of really just frenzied momentum … what we ultimately need is the next stock to go from $2.00 to $12.00. Or whatever, $10.00 to $30.00 / $40.00 because that’s what’s gonna trigger that next round of FOMO. Just wanting to really capitalize. I think that’s ultimately the thing to wait for. We’ll make the most money on parabolic stocks. These ones right now are just kind of … it’s a grind. This AGMH we were watching, it’s a recent IPO breakout, but it just doesn’t have a lot of volume. Huge spreads, 55 by 1204. It’s like you want it to work, you want it to squeeze up, break over 12.83 and go back to 15, but I just don’t know if today is the day. It just feels like traders are being a little bit more cautious. HEAR, maybe it opens up over 13.75. I kept this one on watch. The problem is, we kept seeing it surge up and then drop down. This thing just hit 13.70 and it’s now back at 13.50. So it pops up 20 cents and then drops back down. Then, it pops up another 20 cents, then drops back down. So the problem with trading these is, you just keep getting chopped up. Hey, I would love to finish the day great. Probably more than anyone, because I was green on the day. There’s nothing worse than going from green to red. So, I would love to go back to green. The easiest way to do that is to grab 5,000 shares of this and sell it for a 30 cent winner. But then this is what happens. You get in those 5,000 shares at 60, the next thing you know, you’re down $2,000.00. See, now you’re at 13.25. That’s what’s really difficult to trade, these whips. Where it pops up and then it drops down because it’s not predictable. So the thing to do right now is, to exercise patience, exercise self control. Yesterday for me was a big red day. I need to work my way out of the hole. Today was an opportunity where I could have made back $2,500.00 if I had just finished the day sooner. I pushed my luck and gave back the gains that I had. So, today is a scratch day and we’ll be back at it tomorrow. Hopefully, we’ll be able to finish up the week with a couple of good trades. All right, so that’s about it for me right now. I hope you guys who are trading in the afternoon, you do see some opportunities. But I’m just concerned that there’s not gonna be a lot out there. So, those of you guys watching on YouTube / Facebook, if you like these videos, we’d love to have you subscribe to our channels. 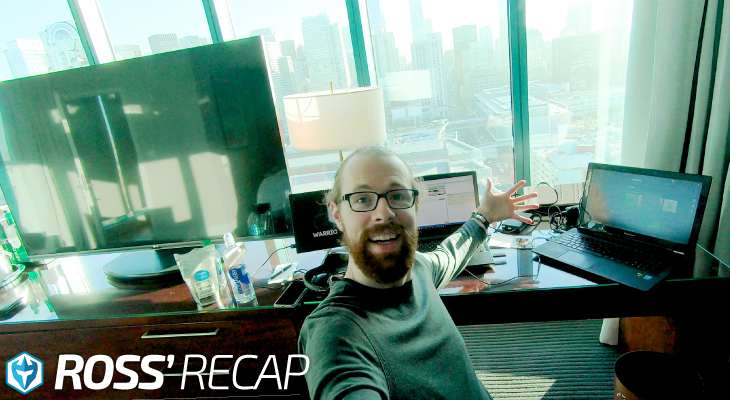 Give us a thumbs up, throw comments down there, we’ll come back and answer them later this afternoon. All right, everyone. I’ll see you all back here first thing tomorrow morning, 9:00 / 9:15 for pre-market analysis. All right, see you guys in the morning.